PHUKET: Australian yachting icon and long-term Phuket resident Rolly Tasker has died, age 86. Staff at the Rolly Tasker sail loft on Chao Fa West Road today confirmed that Mr Tasker passed away in Australia overnight (Phuket Time) after a long battle with cancer. The general manager of the loft, Michael Tasker (no relation), who had been working for Mr Tasker for the past 15 years, described the reaction of the floor staff when he broke the news: “I wasn’t surprised by the outlet of emotion, but when you consider that the last time he was on the floor with them was September…[Well], I just called them together to tell them he passed away; and that was the reaction – tears. Michael Tasker told the Gazette that he, one of the workers on the floor, and another Thai member of staff would be flying to Australia to attend the funeral service. “I want them to be able to tell the rest of the staff, when they come back, what happened and the occasion and everything else,” he explained. Renowned as a gentlemen entrepreneur and adventurous yacht racer, Mr Tasker won Australia’s first sailing medal at the 1956 Olympic Games in Melbourne. Among his many other accolades, he won his first world championship in 1958, dominated ocean racing off Western Australia for nearly two decades, and won many long-distance ocean races, including the 1979 Parmela Yacht Race from Plymouth, England, to Fremantle, Australia. In total, he covered more than 340,000 nautical miles in ocean races. Mr Tasker was inducted into Australia’s Sports Hall of Fame in honor of his sailing achievements, and was just recently named as Western Australia’s ‘Best Ever Yachtsman’. 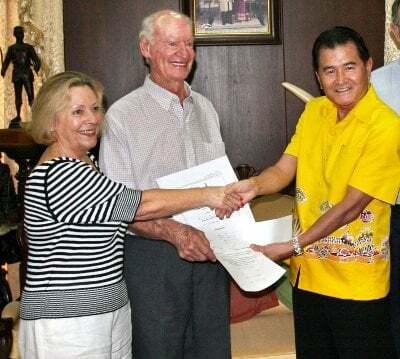 The Phuket Cruising Yacht Club honored his passing with the message on its website: “It goes without saying he will be missed by many clients and friends around the world… He was 86 when he died and going very strong until shortly before he died. The club also posted a link to a video highlighting Rolly Tasker’s remarkable achievements. Mr Tasker is survived by his wife, Kerry, and his two children Sophie and Bobby.